A national dance champion from North Dakota was crowned Miss America on Sunday, becoming the first contestant from the state to win the nearly 100-year-old contest. Mund, 23, was one of 51 contestants in the pageant. (Reuters) – An Ivy League graduate and national dance champion from North Dakota was crowned Miss America on Sunday, becoming the first contestant from the state to win the nearly 100-year-old contest. Cara Mund, from Bismarck, N.D., a graduate of Brown University in Rhode Island, who has been accepted to Notre Dame’s law school, trained for several summers with the world-famous Rockettes. Mund, 23, was one of 51 contestants in the pageant, representing the 50 United States and the District of Columbia. Mund, who adopted the Make-a-Wish foundation which benefits children with life-threatening conditions as her platform for the competition, performed a jazz dance to “The Way You Make Me Feel” for the contest’s talent portion, wearing a double-breasted black mini-dress with a matching fedora-type hat. “Whether you believe it (climate change) or not, we need to be at that table,” she added. The first runner-up was Miss Missouri, Jennifer Davis, who competed on a platform of diversity. She was followed by contestants from New Jersey, Kaitlyn Schoeffel, District of Columbia, Briana Kinsey and Texas, Margana Wood. The pageant was broadcast live on ABC from Atlantic City, New Jersey. The contest returned to the seaside gambling resort a few years ago after nearly a decade in Las Vegas. It was dropped by ABC in 2004 following a steep ratings decline, but returned after years on cable. Judges scored contestants, who ranged from teen-agers to the cut-off age of 24, based on talent, the live question segment, a personal interview and appearances in gowns and swimsuits. Many of the entrants drew on music or dance for the talent portion. The winner receives a six-figure salary, expenses for the year and a $50,000 scholarship. 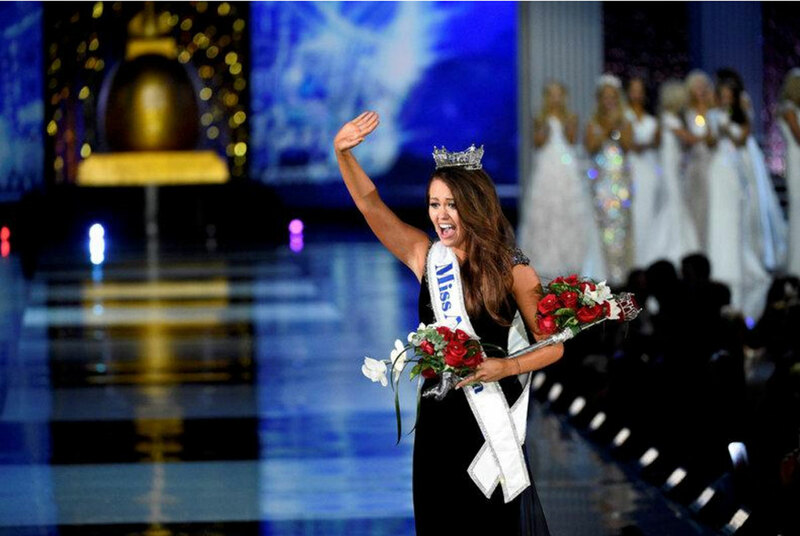 Ivy League graduate and dance champion Miss North Dakota Cara Mund Crowned Miss America of the 97th Miss America Competition in Atlantic City, New Jersey.